Plans have been drawn up for a new road to be built from Bolton Road, on the stretch towards the reservoir, across Brown Bank Lane and through fields like these to Hawber Cote Lane where Silsden's new primary school is to be sited. The road will serve 500 new homes. A second phase would link Bolton Road to Hawber Lane with 400 more houses being built. The plan (above), if approved by Bradford council, will enable some 500 houses (served by the road) to be built on the adjoining farmland. 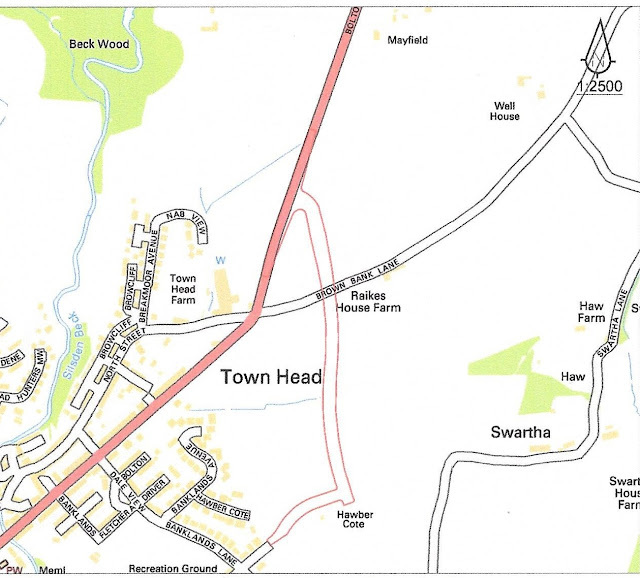 Botlon Road is in red with the proposed new road outlined in pink. The council has designated the fields for housing with a potential final total of 1,000 homes. The updated plan above was published on July 18th. 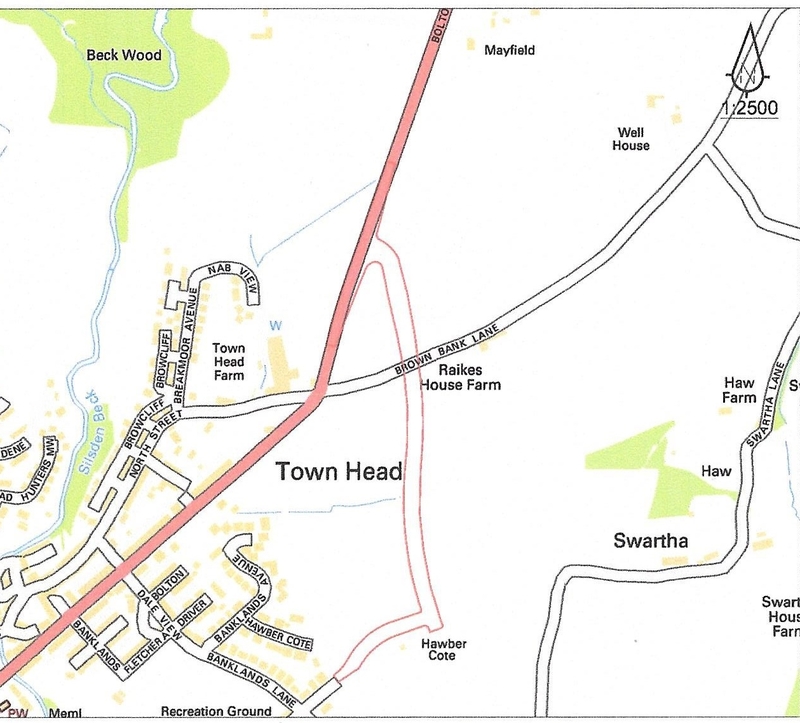 It shows the new road meeting Hawber Cote Lane. The original route had stopped short of the lane at the spot marked Hawber Cote but has now been extended to serve the new school. The road will cross fields from Bolton Road just beyond the 30mph 'island' uphill and cross Brown Bank Lane below Raikes House Farm (pictured above and below). It is not known at this stage how the road will cross the lane. Above: three public footpaths cross the outlined site of the new road. They give popular countryside walks to and from Brown Bank Lane, Swartha, Drabble House Farm and Hawber Cote Drive. 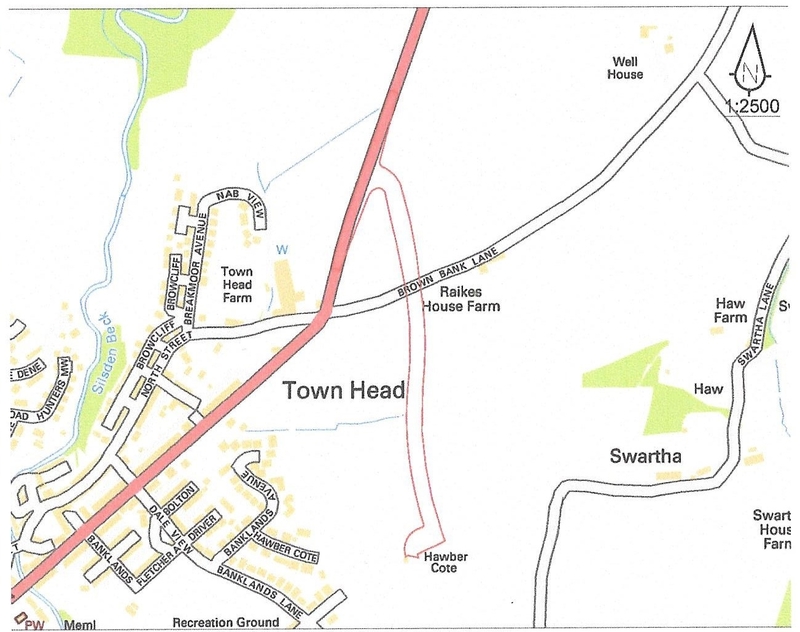 The owners of the land earmarked for housing are named in the application to build the road. They are Mr G Mountain, of North Rigton, and three Silsden residents: Mrs D. Jackson, Mr D. Winstanley and Mr K. Foster. The applicant is the Silsden Development Company Ltd., whose sole director and shareholder is Geoffrey Mountain. The agent is David Hill, chartered surveyors, of Skipton. The view towards Swartha from near Hawber Cote Drive. Handsome trees, sturdy hedges and dry stone walls could be bulldozed. The view from Hawber Lane. Out of frame to the left of the barn hidden by the trees is the Hawber Cote Lane entrance to the fields where the new school will be sited. Ultimately all the fields between Hawber Lane and the Banklands area towards Brown Bank Lane stand to be built on.